I Definitely Want To Reuse My Rockwool, So How Do I Do It? Use Sensizym throughout bloom phase. Make sure you do a Final Phase flush before harvest. After harvest, flush your rockwool thoroughly, and go through it to ensure that no large pieces of root or other material are still present. Keep the medium pH balanced and apply Sensizym for a few more days. Then let the medium dry to the regular wetness that’s optimum for your plants, and reuse the material. I Went To The Hydro Store To Get Sensizym. The Salesman Said That It Had Been On His Shelf About 3 Months. He Said That He Would Not Recommend Other Enzyme Products If They Had Been In The Store More Than A Couple Weeks. So How Long Is Yours Going To Last On The Shelf? We have the strongest guarantee and the longest shelf life in the industry. Under normal storage conditions with a reasonably temperature-controlled store, the shelf life is 18 months. 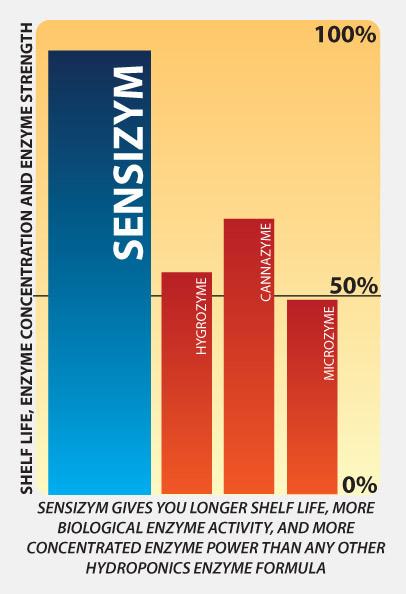 ATTENTION: Sensizym is completely compatible with all pH Perfect® and non pH Perfect® Base Nutrients along with all competitors Base Nutrients and Supplements.